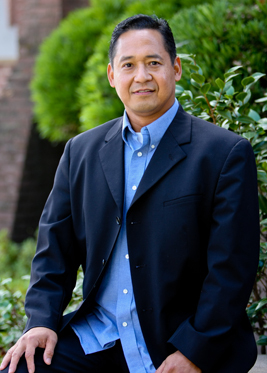 In 2000, Stephen Mercado retired from active service in the military. He had served for 20 years as a jet engine mechanic for aircrafts such as E2 Turbo prop Hawkeye, P-3, and EA6b Prowler and completed a tour as an instructor for the fleet pipeline teaching about power plants and related systems. Upon retirement from the service, he hoped to pursue his dream of a career in Human Services but with full-time job and two daughters in college, Mercado had doubts about finding a program that would work for him. Then he discovered Hope International University’s (HIU) online programs. He is now working toward a B.S. in Human Services with an emphasis in counseling as a part of Hope’s College of Psychology and Counseling. I am so blessed that I am a part of the body of Christ being equipped and trained by HIU to be used for His service and to be servant for mankind. "I am so blessed that I am a part of the body of Christ being equipped and trained by HIU to be used for His service and to be servant for mankind," he said. "I chose HIU because it is a Christ centered, Bible-based school and it exemplifies Christ as the true servant leader," he said. Mercado went on to note that the professors are "experts in their field, but also principled Christians" and the University is very supportive of working professional veterans. Mercado believes that veterans returning from the stressful life of service will find a place of peace and restoration at HIU. Through his military experience and his educational pursuits, he knows he is becoming a stronger member of society who will make an impact on people’s lives. The discipline, resiliency, and adaptability he learned while in the service helps him excel as a student. "My heart’s desire is to impact my community for Christ and to make a difference in people’s lives," he said. "I believe HIU has all the resources to equip me to be an effective servant leader and to advance God’s kingdom through servitude."